Saturday 19th November – Clearing and planting Lord Holland’s pond. Wednesday 23rd November – More pond work and general tasks. All tasks 10.30am – 3.30pm. Tea, gloves, tools and instruction provided. Meet at Holland Park café at 10.30am or call Moira on the day if you’re late - 07879 078101. Wear sturdy shoes and clothes you don’t mind getting dirty. Bring waterproofs, a drink, and a packed lunch. Wear wellies! RBKC in association with Groundwork London. Members will have seen the outdoor board of granite slabs installed on the lawn between the dahlia and sundial gardens. Stone enches for spectators are on their way by slow boat from China and the Friends are investigating a possible gift of chairs for the players. Meanwhile the pieces are put out daily, as long as it is not raining, and their use is free and no booking is required. The Borough was inspired to install the board by a generous offer from the experienced players, some of them grand masters, who have long used the café tables for their games, to give instruction to young players on Saturday mornings, in particular Jason Kuchak who runs a masterclass. They wanted to provide opportunities to play face to face rather than alone at home with a computer. 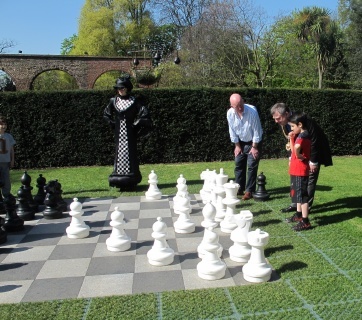 Overlooked by The Black Queen, our picture shows the Mayor, Councillor James Husband, and Councillor Nicholas Paget-Brown being advised by Samir Samadov who won the English Primary Schools Chess Association’s most recent under-9 competition. He has also been the runner up in the British under-8 championships. Samir and his family come from Russia (where else?) and had been living in Lancashire for two years before moving to London. He was thrilled to find new chess contacts in Holland Park.